Cotton is a shrubby plant that is a member of the Mallow family. Its name refers to the cream-colored fluffy fibers surrounding small cottonseeds called a boll. The small, sticky seeds must be separated from the wool in order to process the cotton for spinning and weaving. 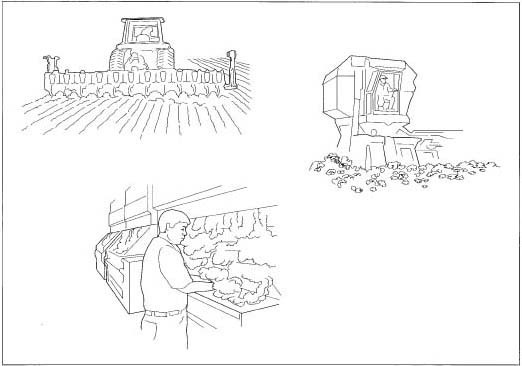 De-seeded cotton is cleaned, carded (fibers aligned), spun, and woven into a fabric that is also referred to as cotton. Cotton is easily spun into yarn as the cotton fibers flatten, twist, and naturally interlock for spinning. Cotton fabric alone accounts for fully half of the fiber worn in the world. It is a comfortable choice for warm climates in that it easily absorbs skin moisture. Most of the cotton cultivated in the United States is a short-staple cotton that grows in the American South. Cotton is planted annually by using the seeds found within the downy wool. The states that primarily cultivate cotton are located in the "Cotton Belt," which runs east and west and includes parts of California, Alabama, Arkansas, Georgia, Arizona, Louisiana, Mississippi, Missouri, New Mexico, North Carolina, Oklahoma, South Carolina, Tennessee, and Texas, which alone produces nearly five million bales. Together, these states produce approximately 16 million bales a year, second only to China. Business revenue generated by cotton today is approximately $122.4 billion—the greatest revenue of any United States crop. Approximately six weeks after seedlings appear, "squares," or flower buds, begin to form. The buds mature for three weeks and then blossom into creamy yellow flowers, which turn pink, then red, and then fall off just three days after blossoming. After the flower falls away, a tiny ovary is left on the cotton plant. This ovary ripens and enlarges into a green pod called a cotton boll. The boll matures in a period that ranges from 55 to 80 days. During this time, the football-shaped boll grows and moist fibers push the newly formed seeds outward. As the boll ripens, it remains green. Fibers continue to expand under the warm sun, with each fiber growing to its full length—about 2.5 in (6.4 cm)—during three weeks. For nearly six weeks, the fibers get thicker and layers of cellulose build up the cell walls. Ten weeks after flowers first appeared, fibers split the boll apart, and cream-colored cotton pushes forth. The moist fibers dry in the sun and the fibers collapse and twist together, looking like ribbon. Each boll contains three to five "cells," each having about seven seeds embedded in the fiber. There is much discussion regarding the amount of chemicals used in cotton cultivation. Currently, it is estimated that growers use, on average, 5.3 oz (151 g) of chemicals to produce one pound of processed cotton. Cotton cultivation is responsible for 25% of all chemical pesticides used on American crops. Unfortunately, cotton attracts many pests (most notably the boll weevil) and is prone to a number of rots and spotting, and chemicals are used to keep these under control. There are concerns about wildlife poisoning and poisons that remain in the soil long after cotton is no longer grown (although no heavy metals are used in the chemicals). As a result, some farmers have turned to organic cotton growing. Organic farming utilizes biological control to rid cotton of pests and alters planting patterns in specific ways to reduce fungicide use. While this method of cultivation is possible, an organically grown crop generally yields less usable cotton. This means an organic farmer must purchase, plant, and harvest more acreage to yield enough processed cotton to make the crop lucrative, or reduce costs in other ways to turn a profit. Increasingly, state university extension services are working with cotton farmers to reduce chemical use by employing certain aspects of biological control in order to reduce toxins that remain in the land and flow into water systems.